Content: Here you can define the source of the content. You can use this widget to show Post Content as well as Term Description (eg Category description). Show Excerpt: This option let you define whether you want to show the full content of just the excerpt. For excerpt you can choose the word length of your content You will be asked to input the word length under Excerpt Size option. It will use the Post Excerpt if available otherwise it will use Post Content and strip it as per defined excerpt size. Unfold: Unfold provide a unique feature where all your content is not visible on page load. A limited part of the content is displayed initially with a button to expand at the end of the content. You can click on that button to toggle content visibility. 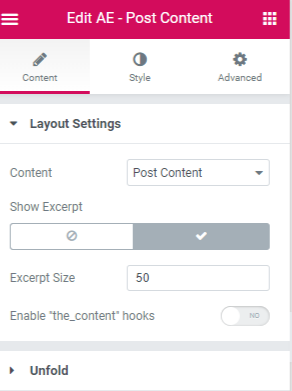 Show More text - Edit and input the text you want to show on the button when your content is hidden and want to expand the content. Show Less Text - Input the text you want to show on the button when your content is in expanded form. Animation Speed - This option will help you to increase or decrease the speed of the toggle button.